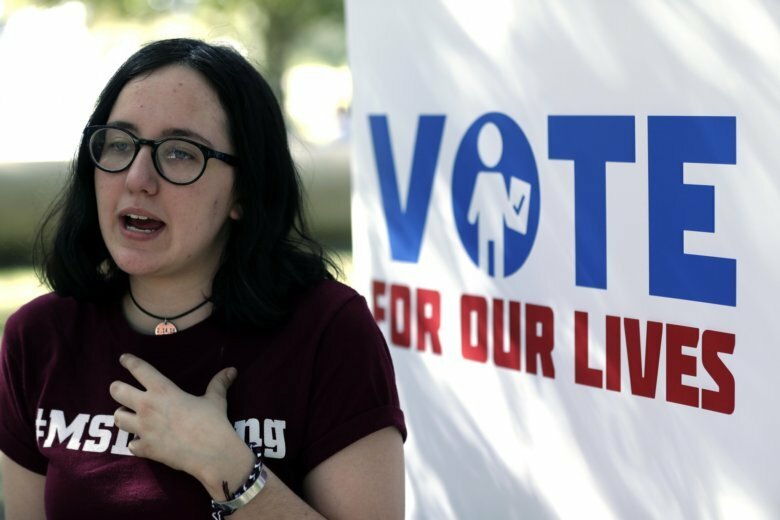 PARKLAND, Fla. (AP) — Nine months after 17 classmates and teachers were gunned down at their Florida school, Parkland students are finally facing the moment they’ve been leading up to with marches, school walkouts and voter-registration events throughout the country: their first Election Day. The Marjory Stoneman Douglas High School student activists set their sights on the 4 million U.S. citizens turning 18 this year. They’re hoping to counteract the voter apathy that’s especially prevalent among the youth during midterm elections. Many of the activists, now household names like David Hogg, postponed college plans to mobilize young voters. Many of them support gun reform, in the name of their fallen classmates. Corin, who voted along with her dad at an early polling site on her 18th birthday, visited a half-dozen cities in just a handful of days last week, getting up at 3 a.m. to board planes. It has been a whirlwind for the students, with celebrity support from Oprah to Kim Kardashian, a Time magazine cover, late night TV spots and book deals — but all of it misses their main target unless it motivates students to cast ballots by the end of Tuesday. At a University of Central Florida event during the final week of election campaigning, Stoneman Douglas graduate and current UCF student Bradley Thornton escorted fellow students to the campus’ early voting site. UCF student Tiffany McKelton said she wouldn’t have voted if the Parkland activists hadn’t shown up on campus. “I’ve never voted in a primary election. I actually did it because of them,” said McKelton, a psychology major from West Palm Beach. In the past months they’ve boarded countless buses and planes, passed out T shirts, and hosted BBQs and dance parties on college campuses around the U.S.
Thornton said talking things through often does the trick. “I can’t tell you how many conversations I’ve had that were like, ‘Ah, I’m not interested’ … and through just a simple, really nice cordial conversation, they get this magical inspiration to vote,” Thornton said. Corin said she’s encountered plenty of voter apathy along the way. The students often note that voter turnout in the last midterm elections was the lowest since World War II. It remains to be seen what role the youth vote will play in this year’s midterms. The 30-and-under crowd is more likely to vote in this year’s midterms than in the past. Forty percent say they’ll vote, compared to just 26 percent in 2014, according to a new poll by Institute of Politics at Harvard University’s Kennedy School of Government. They’re being pushed, in part, by a strong disapproval of President Donald Trump. Trends in Florida’s early voting suggest a surge in young voters. Of the 124,000 people aged 18 to 29 who had voted in person at early polling stations as of Thursday, nearly a third did not vote in the presidential election in 2016, according to analysis by University of Florida political science professor Daniel Smith. About half of those new voters were newly registered. “There are newly energized voters who sat out in 2016, or have registered since then, who are turning out. There’s no question about that,” Smith said. In contrast, for people 65 and older who had voted early and in person, about 7 percent didn’t vote in 2016. Matt Deitsch dropped out of college after the Feb. 14 shooting at Stoneman Douglas to help start March For Our Lives alongside his younger siblings, Parkland survivors Ryan Deitsch and Samantha Deitsch. Corin said the young activists will continue with their mission regardless of the election outcome. “The fact that we’ve engaged a new generation of voters, that’s a win,” Corin said.